Like other design fields, interior design is inextricably tied to changing styles — what’s hot and what’s not. 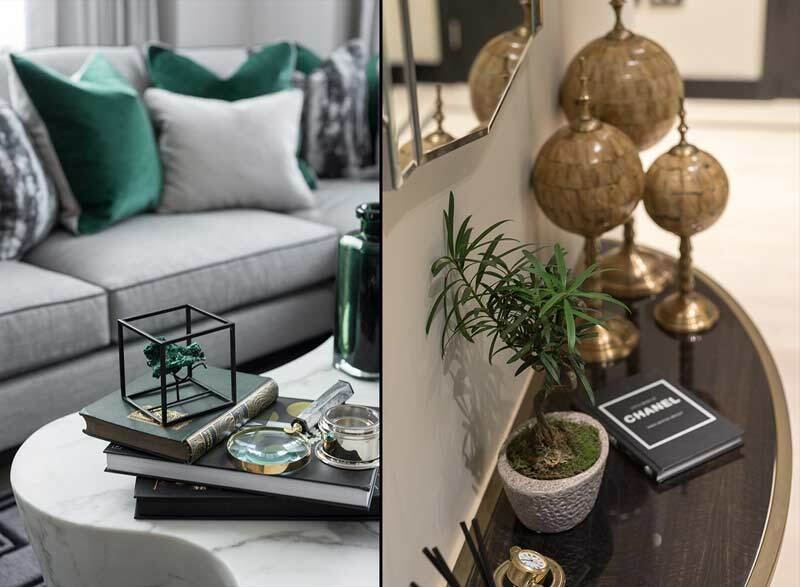 And firing up this year’s autumn and winter trends is a paradigm shift towards a more sustainable aesthetic: interiors with a natural, eco-conscious theme. 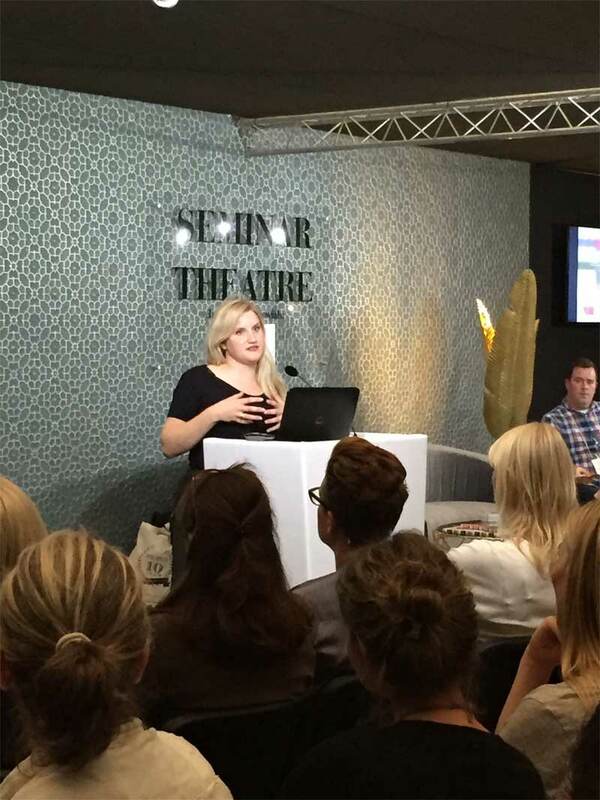 Colour Hive’s trend consultant manager Hannah Malein’s recent talk at Decorex brought to life the importance of natural elements, upcycling and overall sustainability in reshaping the interior landscape – one inspired by the beauty of the natural world. 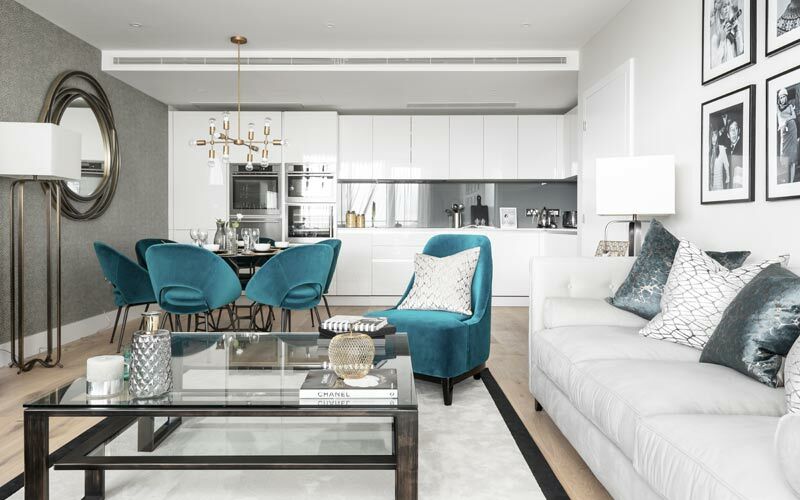 Deep greens to smokey oranges, pastel pinks to metallic blues, ani M INTERIORS presents four interior looks expected to dominate the design scene in 2018/2019. A beautifully balanced palette of moss green, beetroot red, amethyst and a piercing, icy blue (amongst others), Rapture is at once bold and delicate: a colour scheme that fills a home with warmth and positivity. A trend that calls on reconnecting with personal values and exploring the way we are becoming more in tune with our planet and nature, Rapture reconnects us with our spiritual side. In today’s tumultuous world, Rapture is wholesome and grounding. It compliments natural, earthy greens with more spiritual lilacs and purples to produce a rich and verdant spectrum. 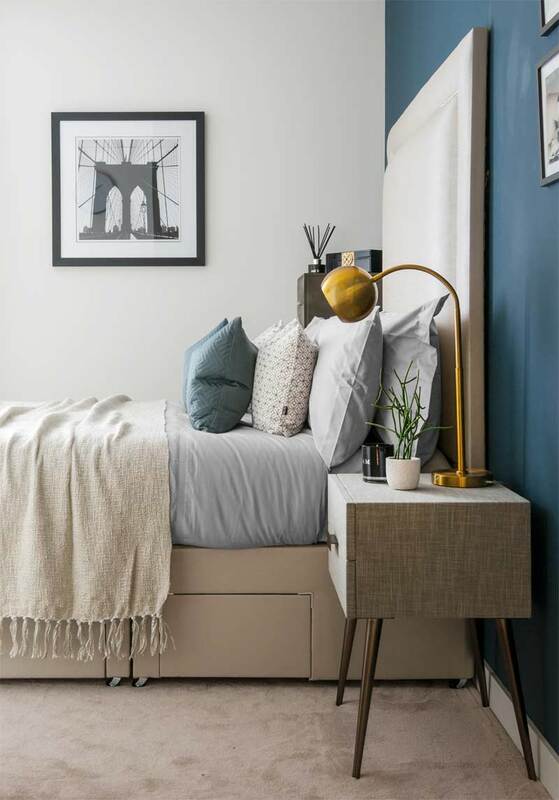 It experiments with a diverse, lively palette to create a nurturing and calming space that you can enjoy all year round. The heavy, overpowering dominance of the digital age is offset with Beyond’s light, airy colours. Neon pink, powdery peach and metallic blue are wonderfully ethereal and soothing – a visually pleasing palette that provokes an indulgent, multi-sensory experience. 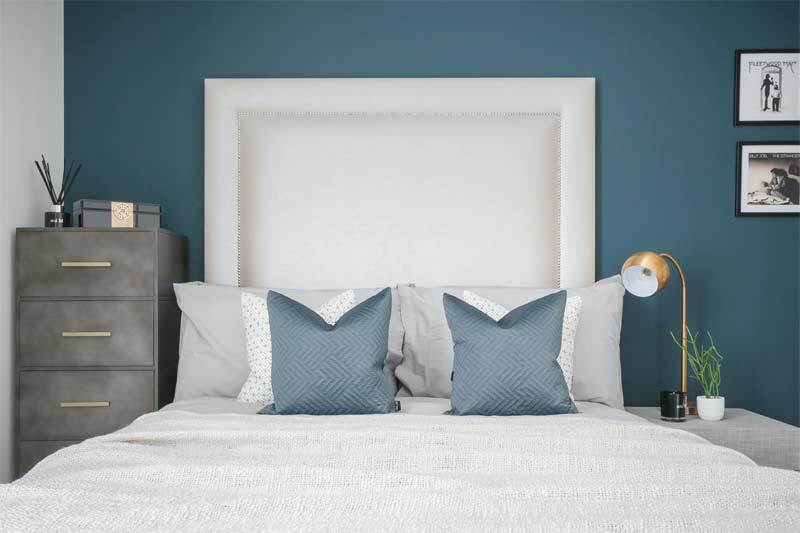 Be it a statement sofa or a feature wall, Beyond’s pale hues are perfect for a calm and elegant atmosphere. 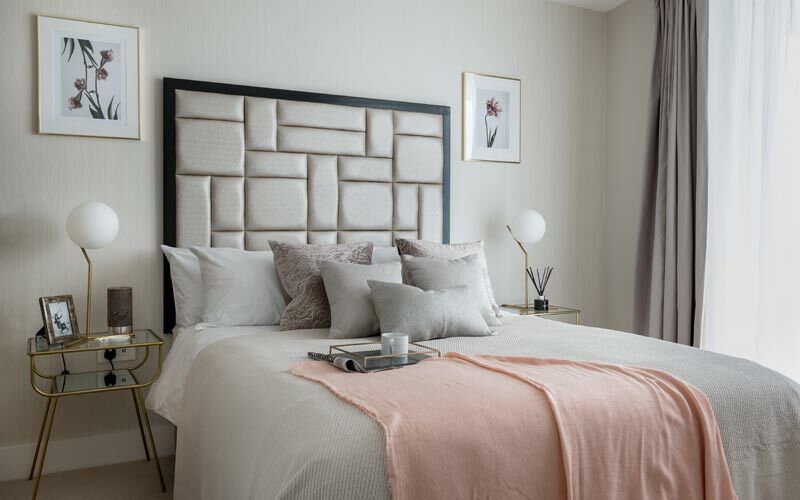 These versatile pastels and neutral metallics are breezy and flowing, subdued yet vibrant. 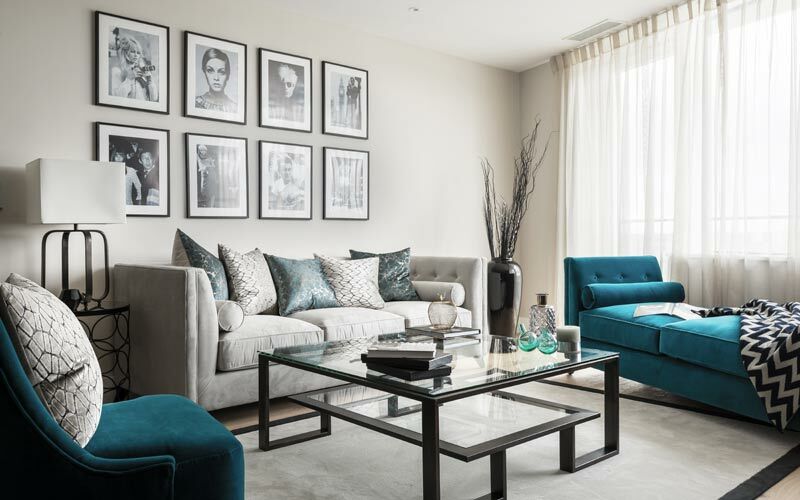 In a city apartment or rustic chateau, their versatile colours focus on delicate, graceful design. They both comfort and invigorate. Evoking a sense of calmness, fluidity and balance, the fusion of these unique shades provides the perfect antidote to busy, modern life. Earth, Air, Fire, Water. The Filter trend finds beauty in impulsive, unpredictable elements. With a palette of smoky white, burnt orange and blazing red, soft brown and a brilliant sulphur yellow, Filter’s colours evoke the warmth and depth of nature’s very own hues. A harkening back to all that is primal, with a seductive call to the elements. Contemporary design is not only becoming eco-friendlier, but also celebratory of man’s connection to the nature. These vivid, glowing shades blur the stark lines of modernity with echoes of the natural world. A breath of these earth-based tones in your interiors will add an immediate sense of richness and character to your home. Punchy, bold and striking. These are the colours that dictate the final AW 18/19 trend, Control. With climate volatility posing serious, often incalculable impacts on the environment, individuals are seeking solace in a sense of stability and permanence. Fuchsia pink, vibrant green and bright yellow, Control’s neon tones share a synthetic quality – one that is perennial and unfailing. They are dynamic and spirited, and ring with a blaring resonance. Add any of these colours to your living rooms or bedrooms for a playful, sophisticated touch. Four completely unique trends that highlight the invaluable need for natural preservation and a more earth-based understanding of the world, interiors across the world are about to become that much more colourful. Feel inspired to transform your home into an eco-haven? 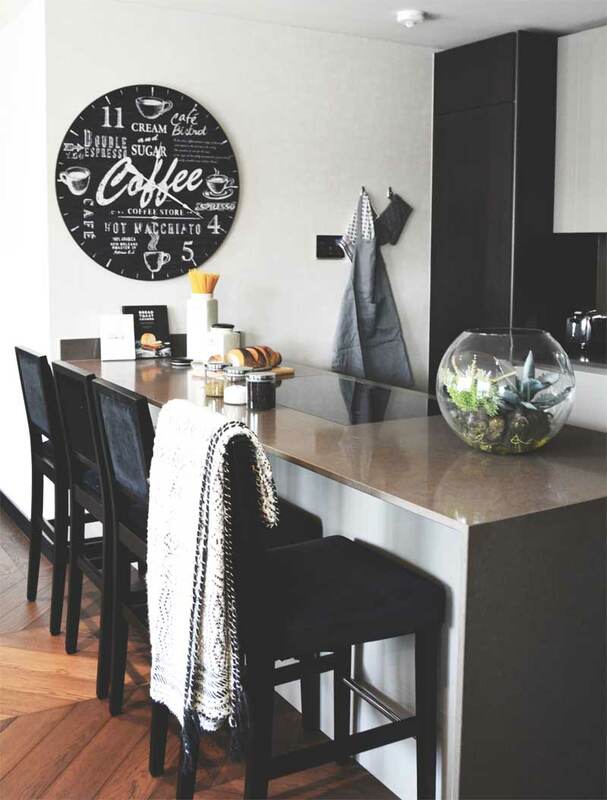 Get in touch with the ani M INTERIORS team to introduce any of these vibrant trends into your own living space. 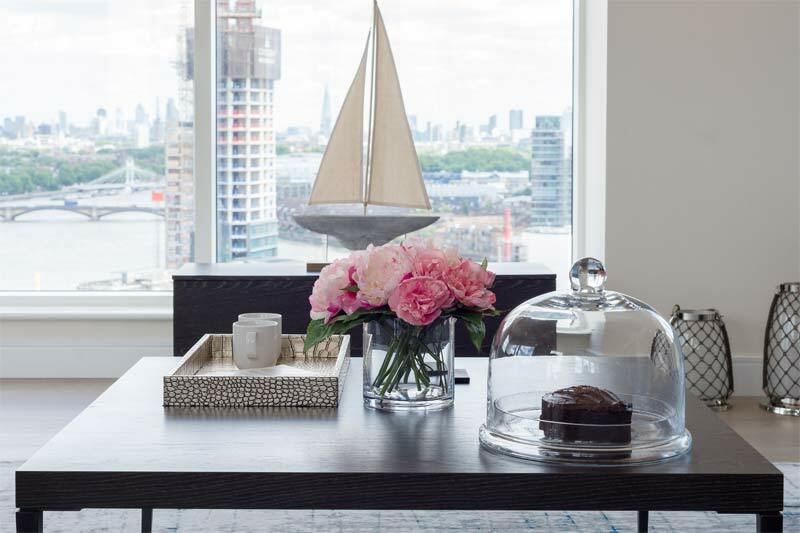 Modernist mid-century furniture, zingy accent colours and eye-catching art were just some of the beautiful design elements incorporated by the ani M interiors design team at this two-bedroom luxury apartment overlooking Tower Bridge. 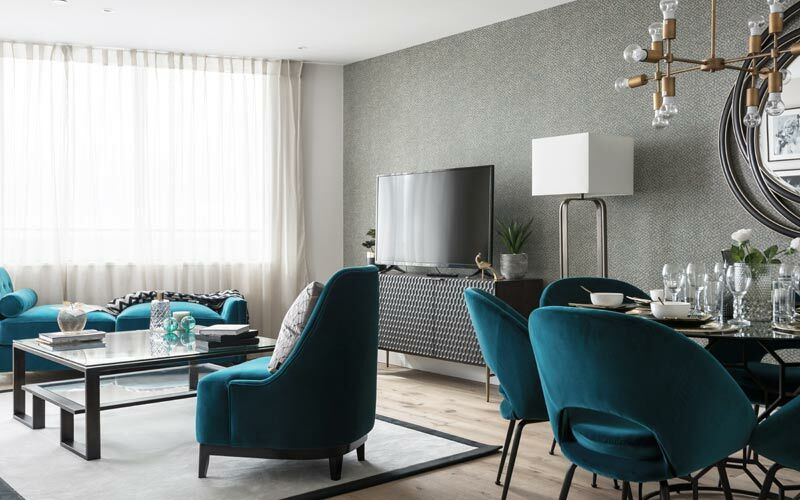 Referred to our team by Berkeley Group, the client wanted to create a striking finish in their home, mixing cool, contemporary furniture with a touch of Scandinavian charm. 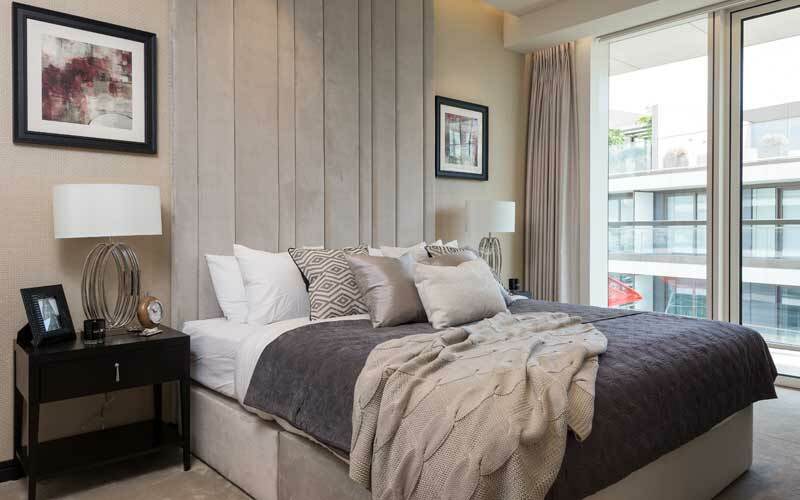 After an initial consultation discussing wallpaper choices, furniture dimensions and additional fittings, the ani M designers set out to achieve a beautifully crafted interior space, combining both luxury and comfort. 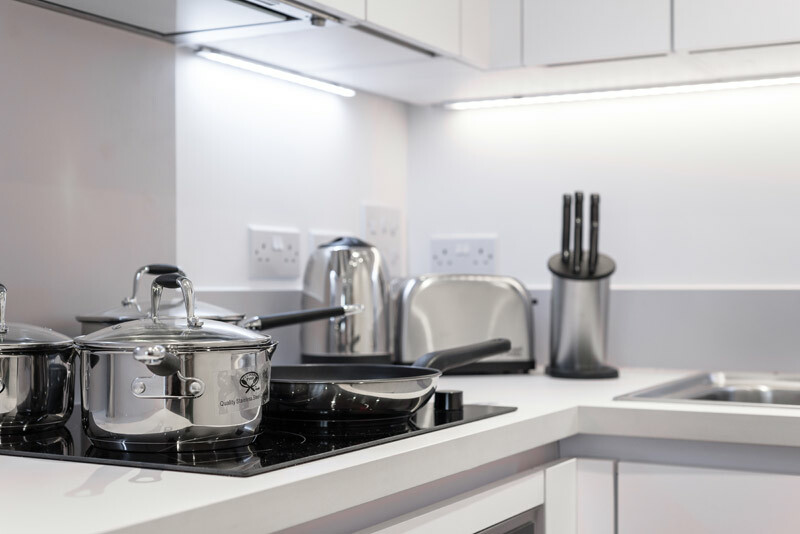 As the client had already purchased a variety of items themselves, the team’s responsibilities lay in their creative expertise to seamlessly tie the whole scheme together. 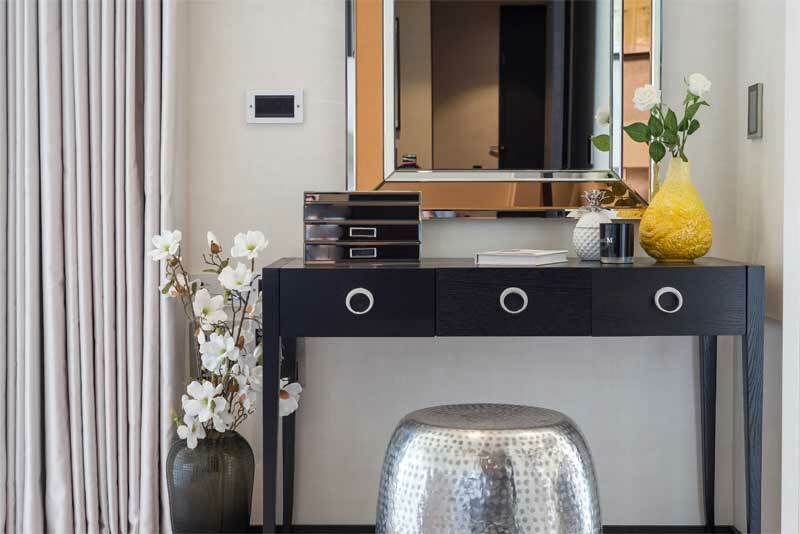 With a chic blend of soft furnishing, lighting, mirrors and hard furnish items, the designers were able to beautifully intertwine the client’s pre-existing furniture with fresh, new décor. 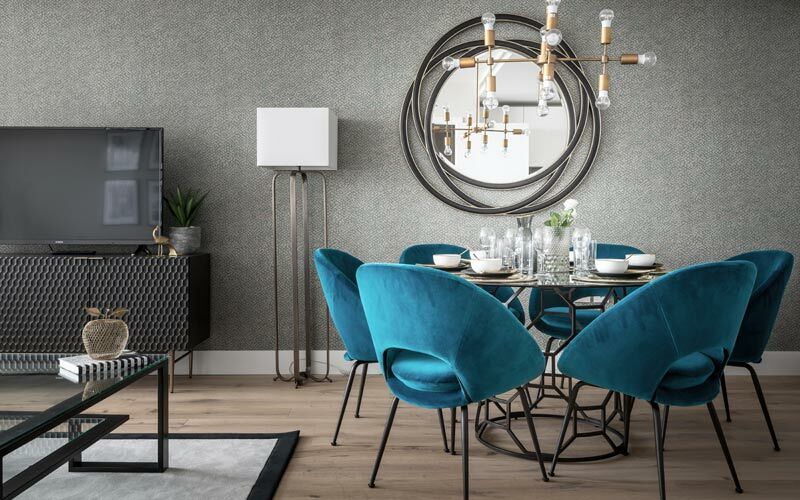 In the living room, a light wallpaper lends the perfect backdrop for shimmering metallic accents, like a wall mirror with a gorgeously detailed mosaic frame. 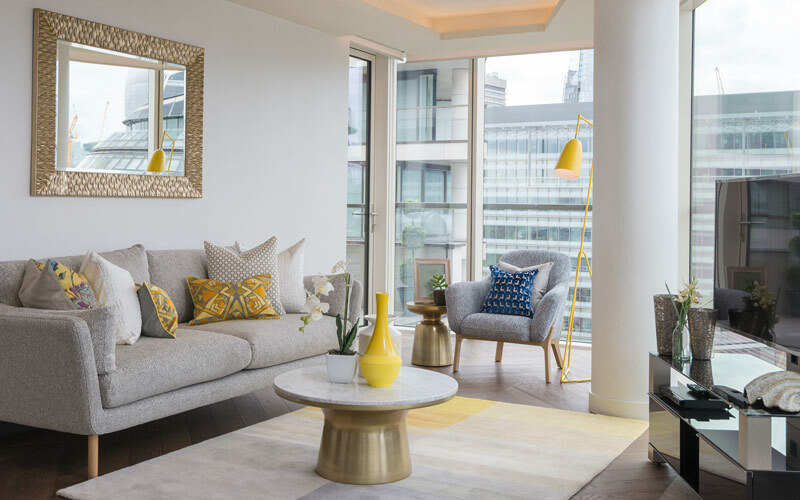 The team chose to enhance the client’s gold pedestal coffee table and side table with lemon yellow accent pieces – a bright ceramic vase and floor lamp instantly adding an energising, modern flair. 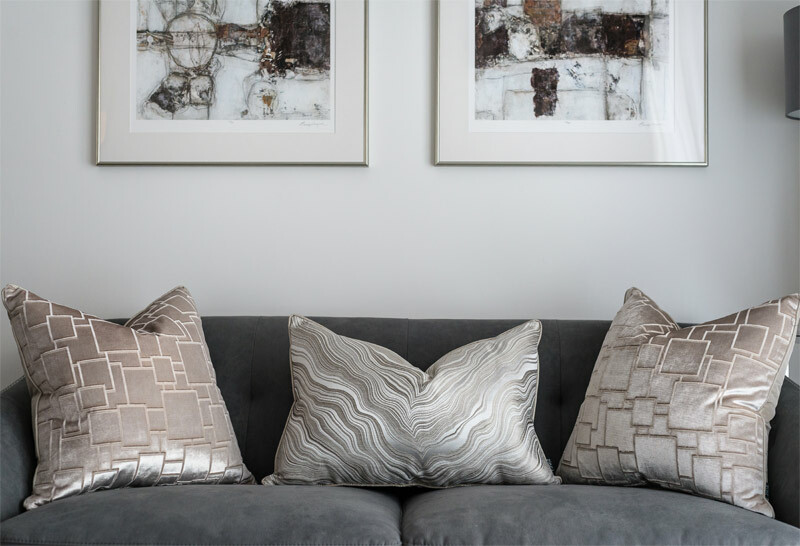 A scatter of patterned cushions complements the lounge’s vibrant aesthetic, and add depth to the minimalist, mid-century style furniture. On the sofa, pale grey and sunshine yellow are a match made in interior heaven; a classic colour combination that brims with Scandinavian cool – understated, with wonderfully retro influences. On the lounge chair, a blue tone to the upholstery fabric lends itself effortlessly to marine blue and white geometric cushions, yet another timeless colour palette. 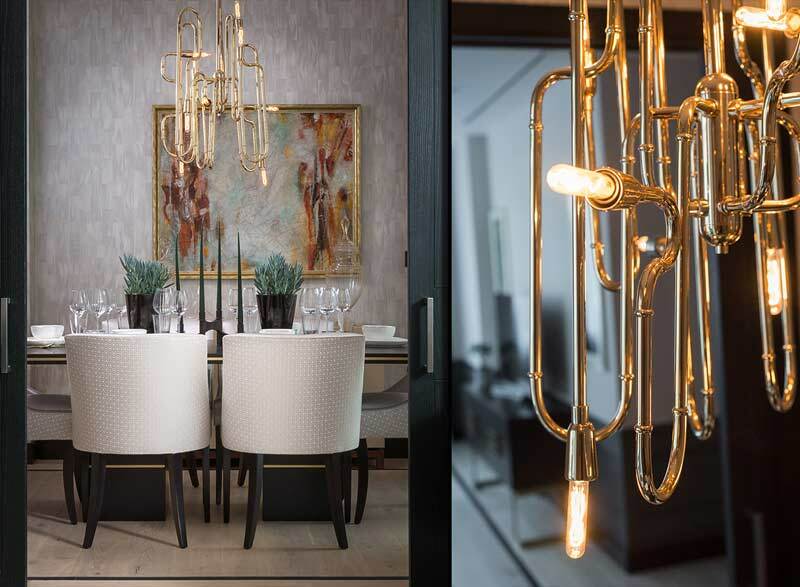 From gold geometric candle holders to fruit ornaments, modern metallic accents bring a glamorous shine to the room’s classic wooden dining table. The stylish arrangement of decorative pieces exudes a refined, polished look alongside a table that gives the feel of a lavish, high-end dining experience. 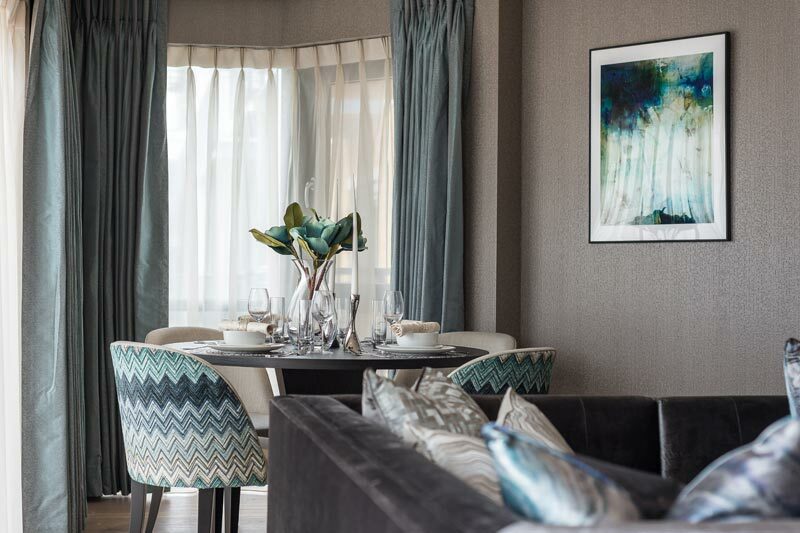 Paired with the apartment’s stunning riverside view of London landmarks, the lounge’s dining area makes for the finest of culinary experiences, right in the comfort of one’s own home. 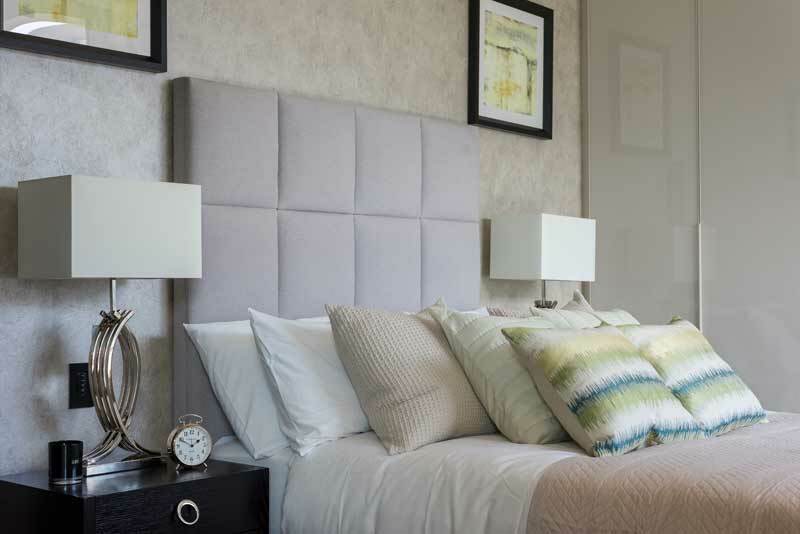 In the bedrooms, a range of design elements create soft, welcoming spaces for the end of any long day. 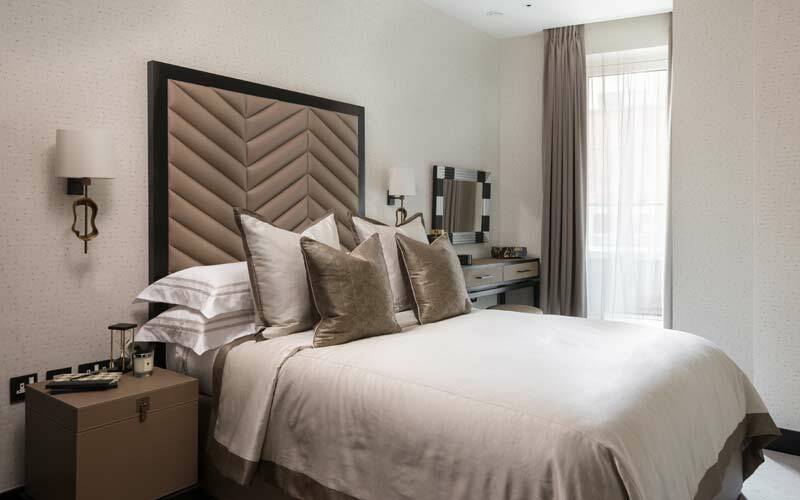 The team’s carefully selected artworks, bed throws and dressing table accessories give both rooms a distinctively luxurious feel. 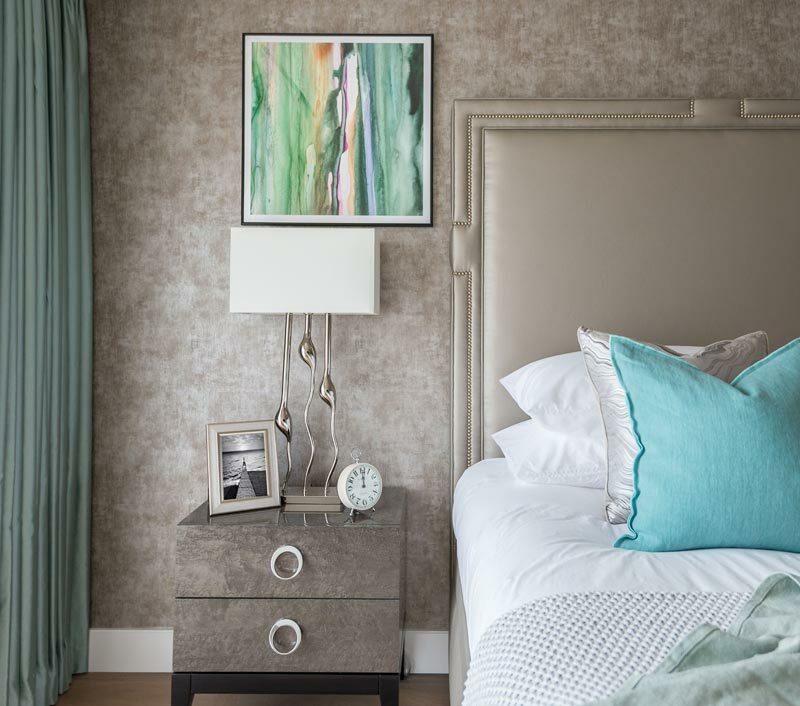 In the master bedroom, metallic sheen wallpaper sets a dazzling scene, whilst abstract wall art and white fabric table lamps illuminate the room in style. 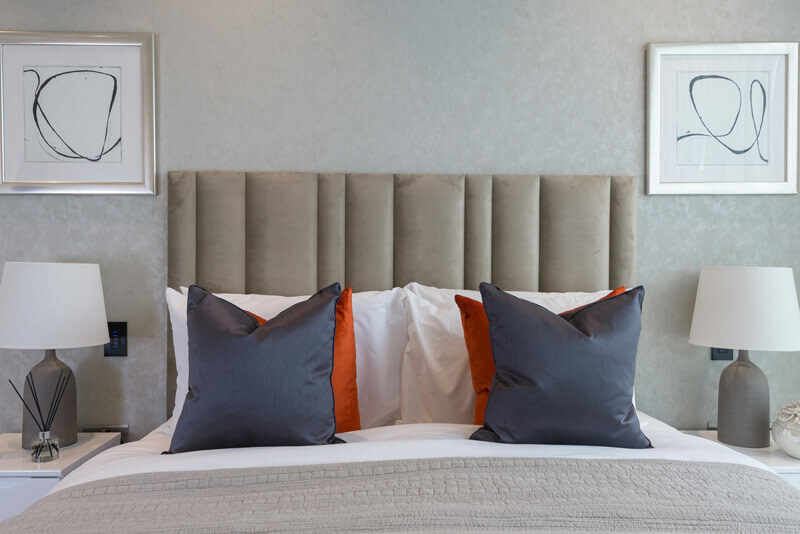 Upon the client’s request to replace the headboard, the team suggested a soft truffle upholstery fabric to accentuate the warm tones of the feature wallpaper. The finished result? 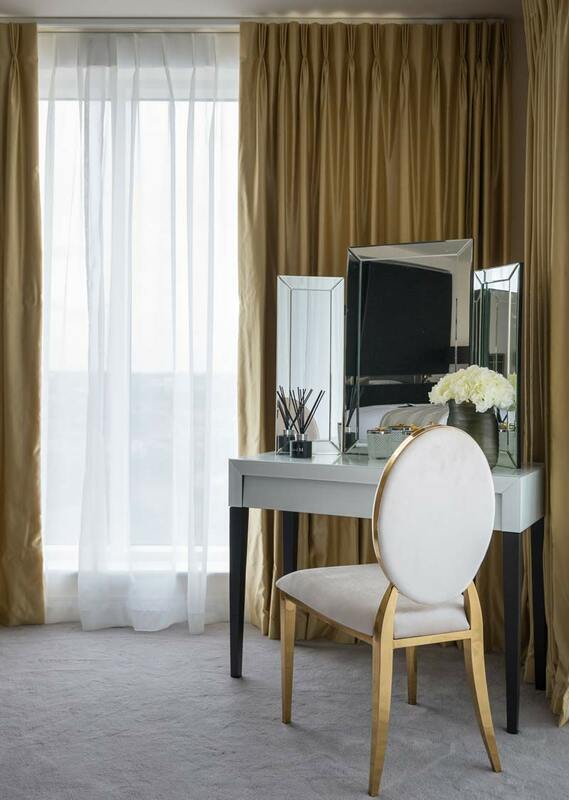 A design that emanates simple elegance and sophistication. 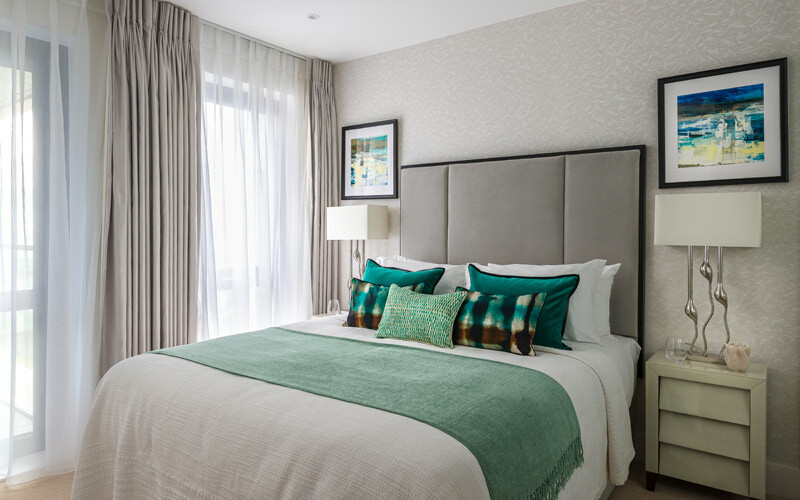 Striking artwork, tropical decorative cushions and caged lamps add an undeniably stylish edge in the second bedroom. 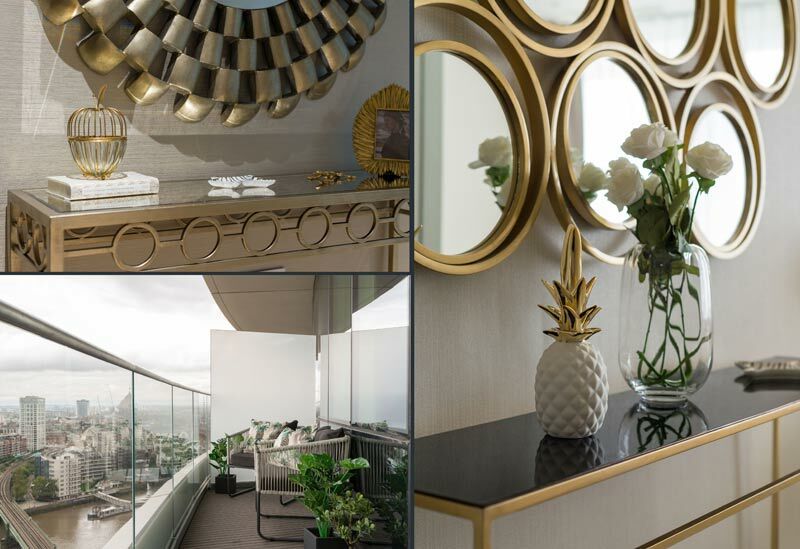 The team’s careful attention to detail is apparent in each room and even out to the corridors, where beautifully framed mirrors and geometric art designs bring the apartment’s walls to life. 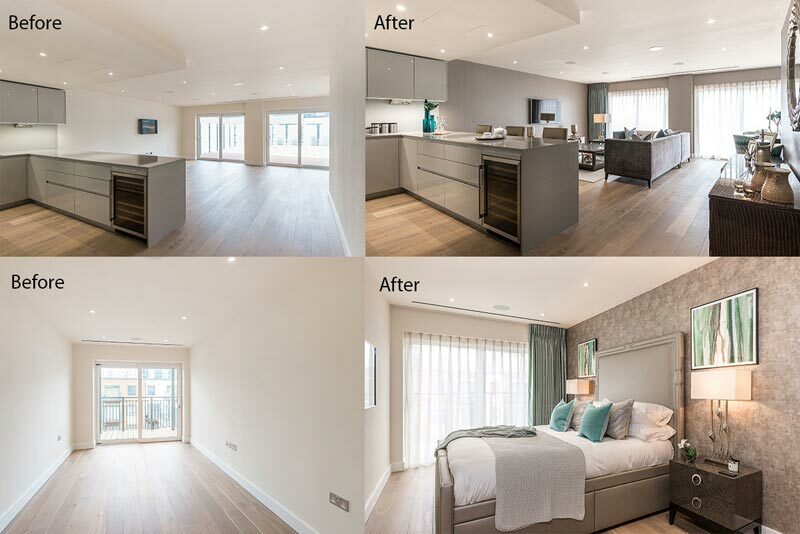 In addition to bespoke interior design services, the ani M team offered efficient, high-quality refurbishment at the client’s request. 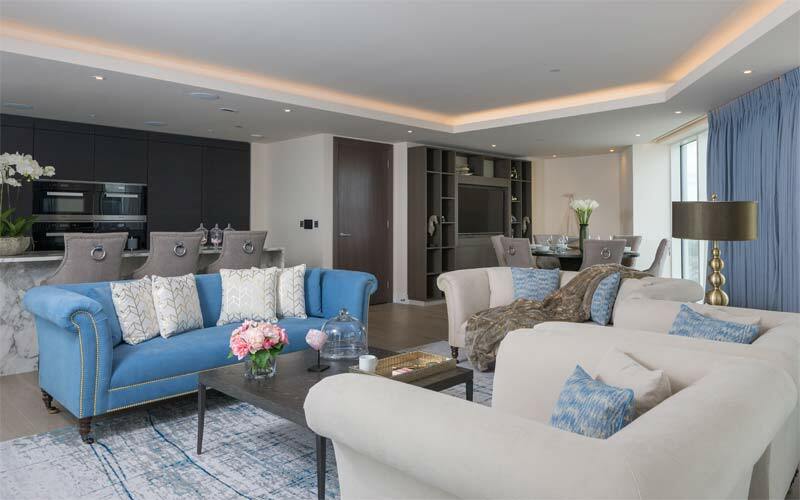 From a new electrical plug socket installed in the hallway to a modern bespoke sideboard, storage cupboards to shelving, the refurbishment team helped to fulfill the client’s visions for flawless functionality. 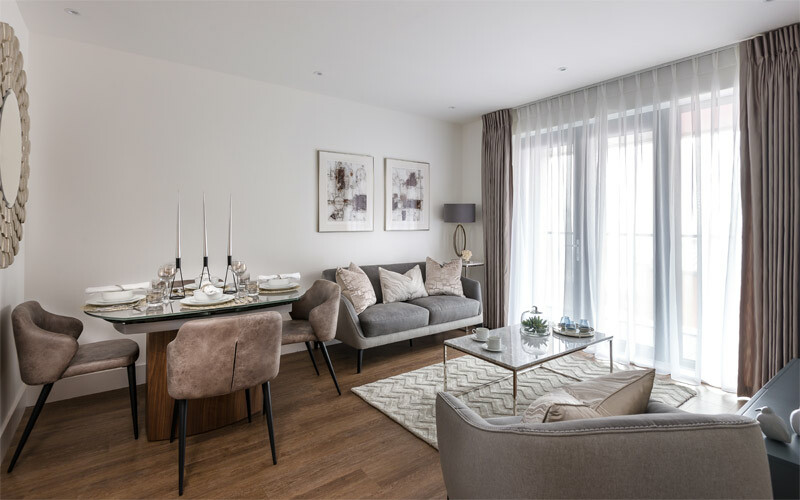 If you too would like to incorporate the simplicity, utility and beauty of contemporary design in your home, get in touch with our interiors team today. 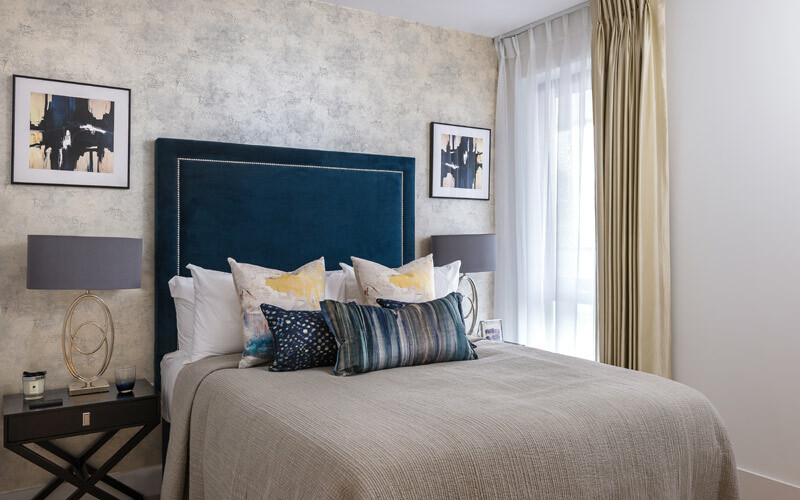 Navy blue hues, sumptuous velvet and eye-catching embellishments make way for a visually-stunning interior at a recent design project for a client’s two-bedroom apartment in Earl’s Way, South East London. 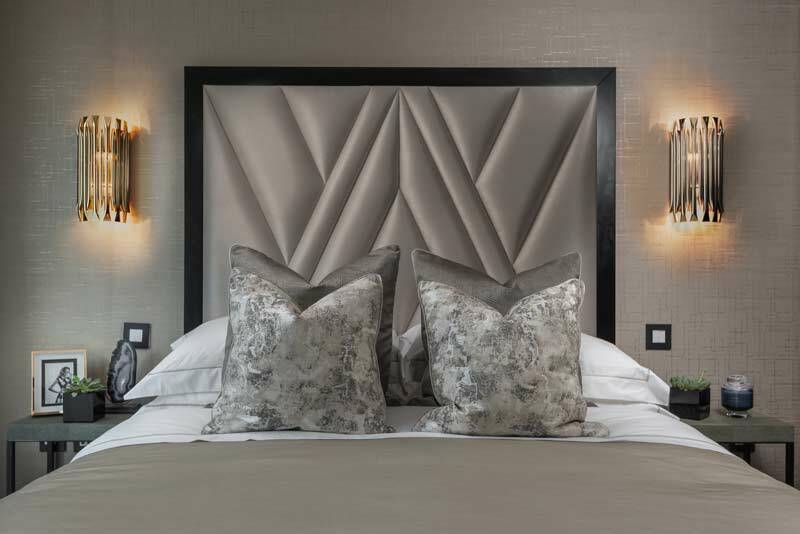 Requesting a space that was luxurious and contemporary, the ani M design team turned the client’s vision into reality with bespoke furniture and fittings, a timeless colour palette and beautiful decorative accents. 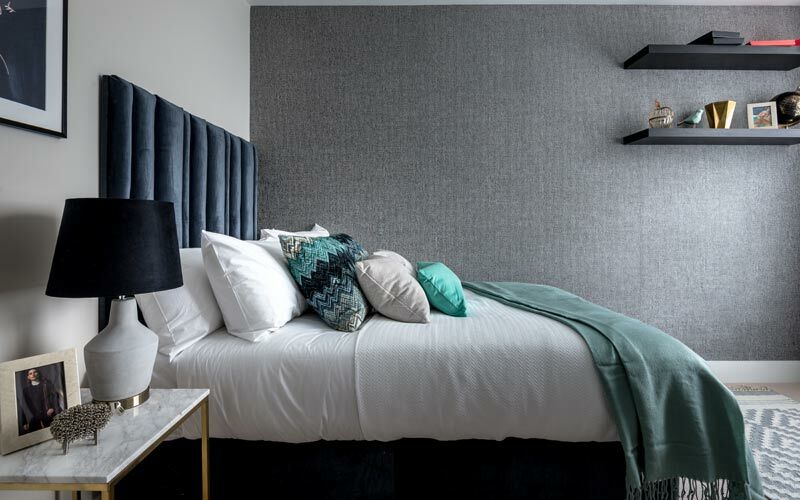 With distinct character and modern flair permeating every room, the team’s careful eye for detail led the way to a truly beautiful and harmonious interior design. 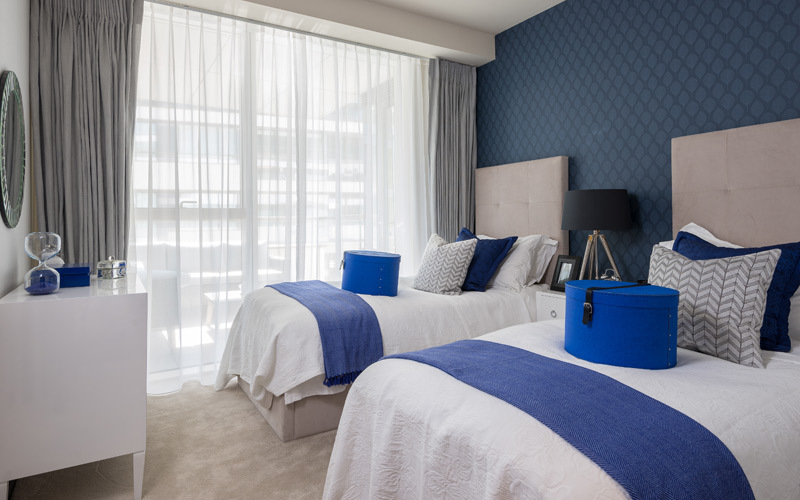 Deep blue tones set against crisp neutrals creates a breezy charm in the lounge area – a simple and yet gorgeous colour duo that remains on-trend throughout the seasons. 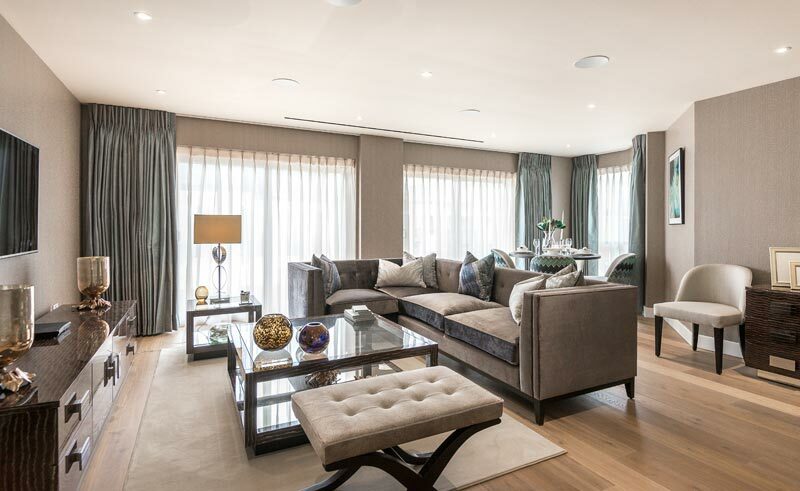 Decadently soft velvet sofas, armless lounge chairs and plush cushions create a warm, inviting space, perfect for winding down after a long day. 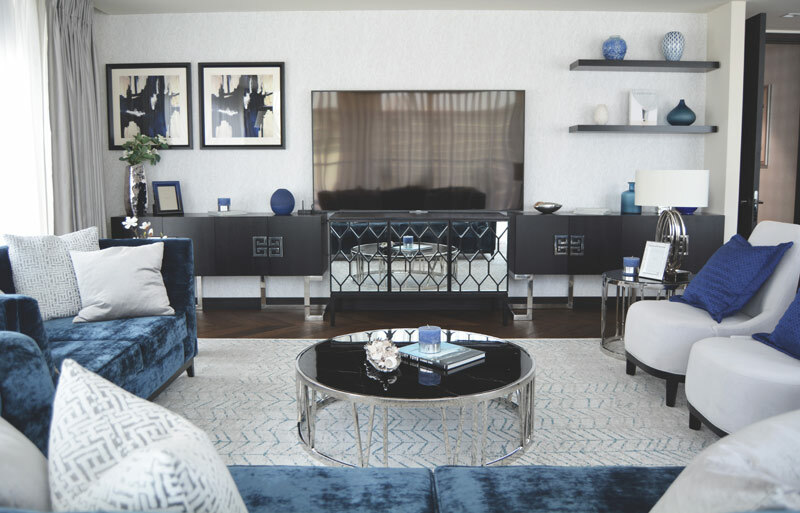 Elevating the lounge’s blue accents, elegant metallic surfaces – from a chrome coffee table to a gorgeously detailed mirrored cabinet – lend the area dazzling dimension and understated glamour. 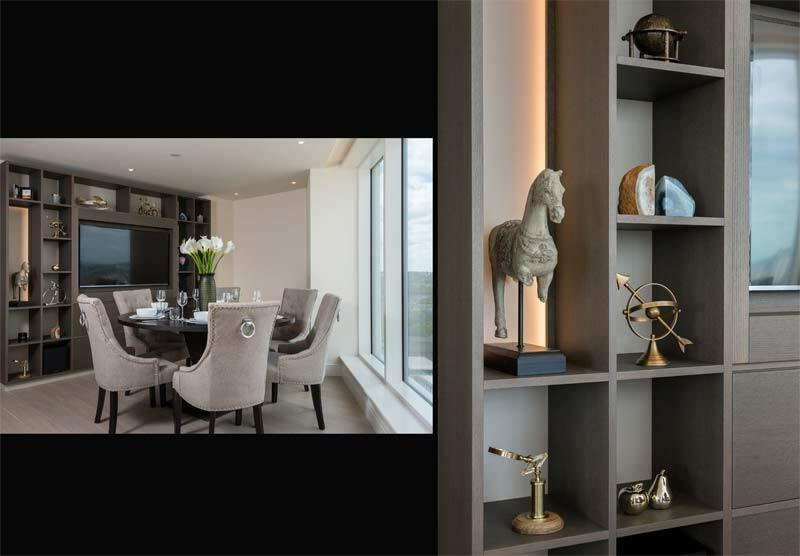 This, combined with abstract art pieces and shelves peppered with unique ceramics, creates a truly striking interior. 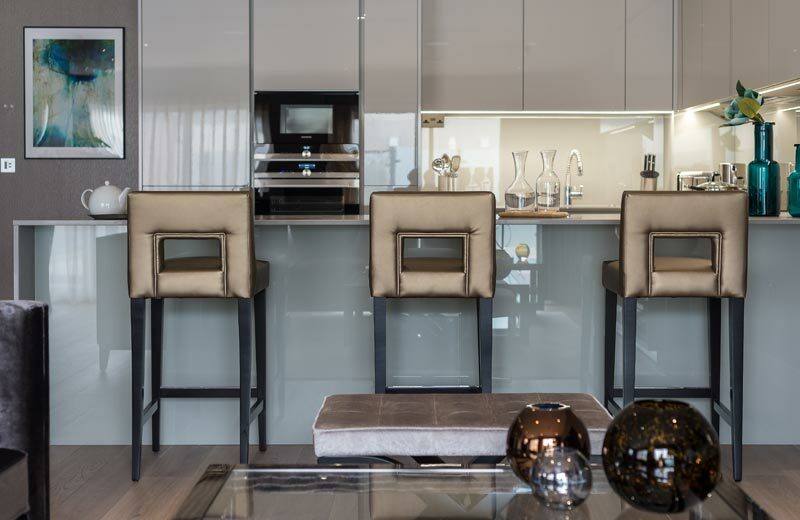 In the open-plan area, a dark oak table sets the scene for an unparalleled dining experience. 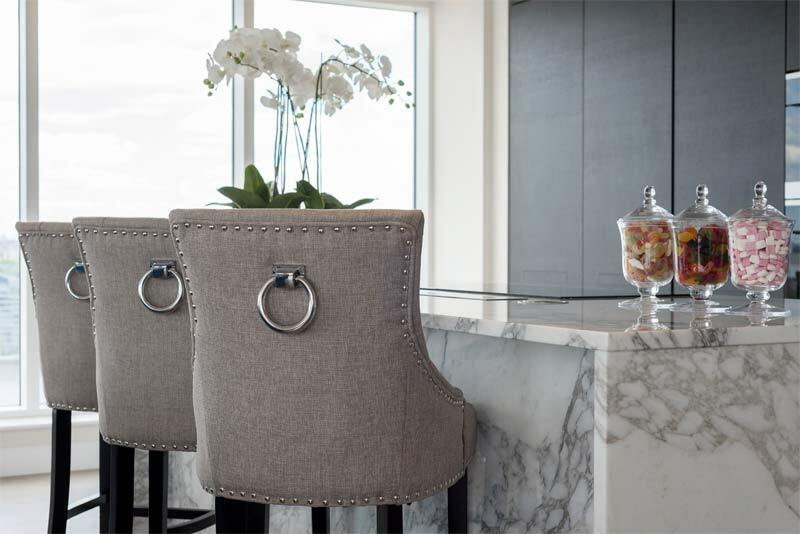 Eight beautifully upholstered chairs make the perfect seating arrangement for entertaining family and friends. 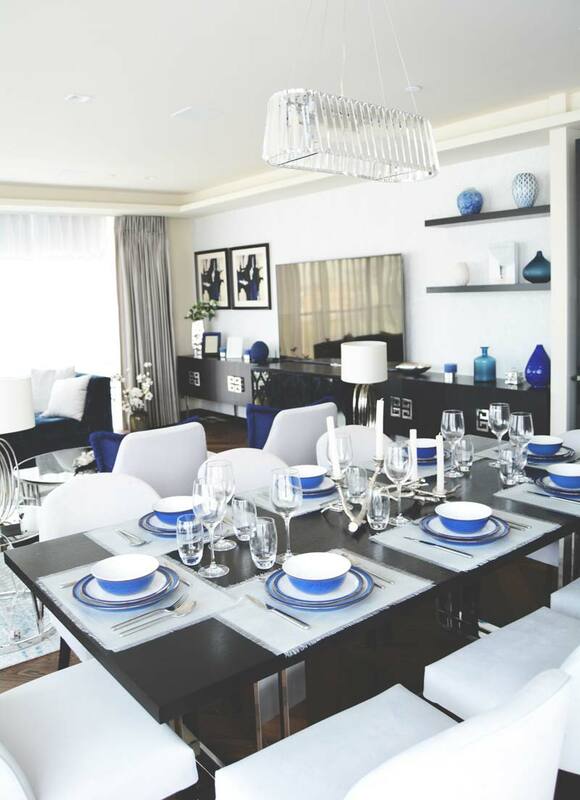 The sleek sophistication of the dining furniture is complemented by ornate tableware, including a metal candle holder, delicate glasses and fine china crockery with stunning blue detailing. These intricate details finish off the table gorgeously, creating an elegant setting for dining and the perfect place to entertain in style. 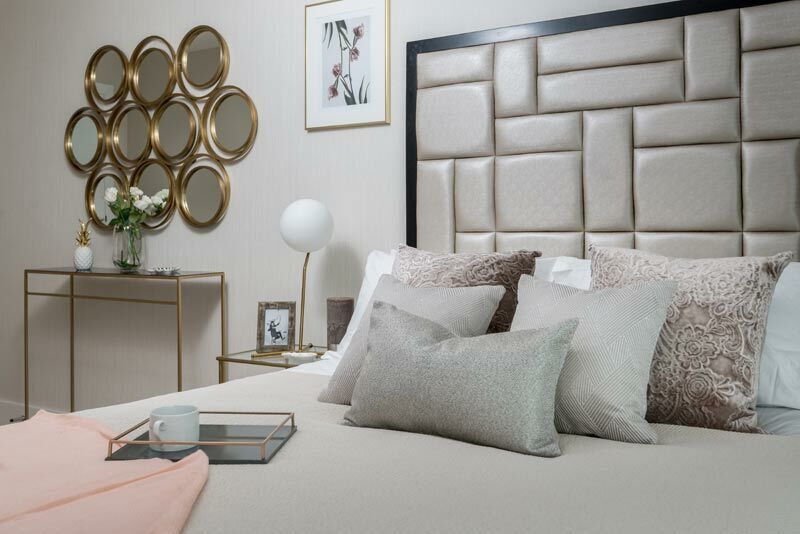 A magnificent interior in the master bedroom combines comfort and grandeur, with luxurious layers and a flawless window treatment lending a polished, timeless look. 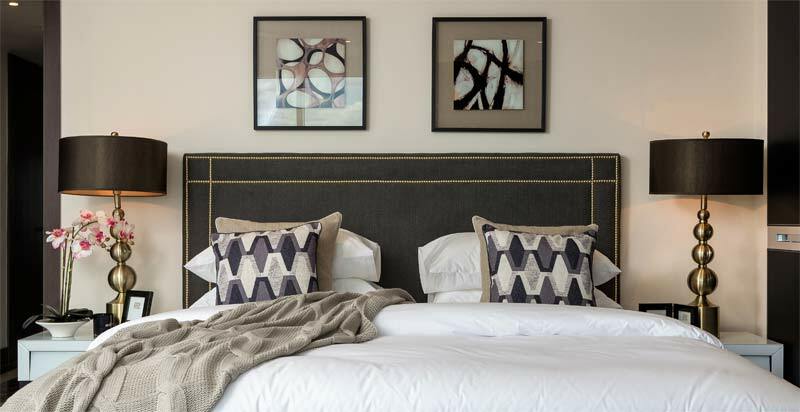 Cream-coloured furniture, bedding and décor wrap the room with subtle warmth and elegant simplicity, while a dark grey, floor-to-ceiling headboard exudes a chic, cosmopolitan glamour and contrasts perfectly with the room’s neutral hues. 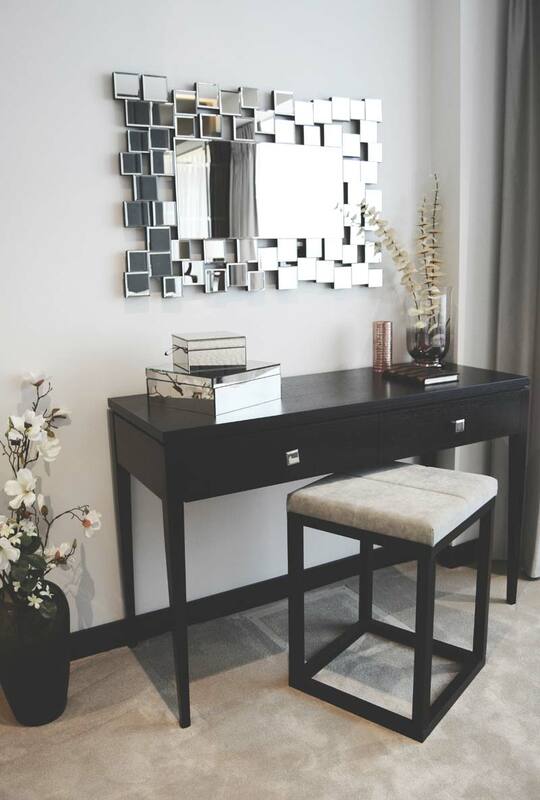 In keeping with the room’s sophisticated design, a sleek, high gloss console table and decorative mirror create a beautiful statement corner. 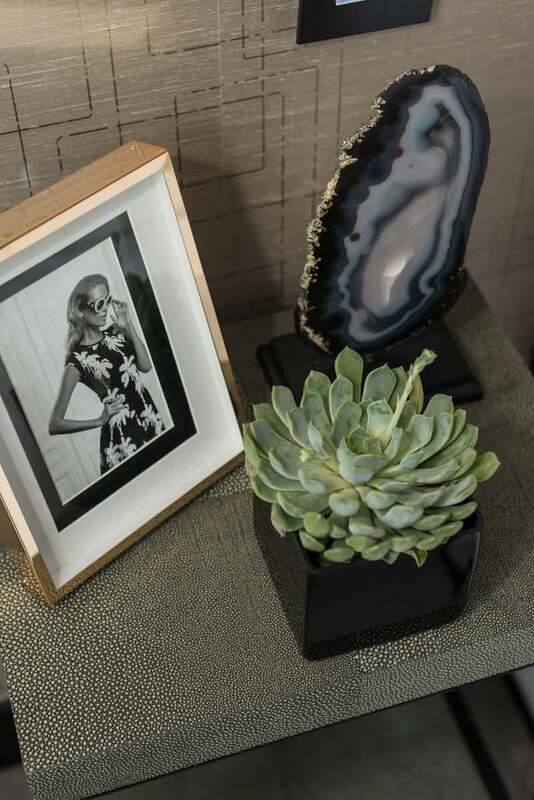 The team’s carefully chosen accent pieces provide a highly personalised touch, with floral arrangements and vintage-inspired mirrored jewellery boxes blend trend and elegance together to create a stunning aesthetic. 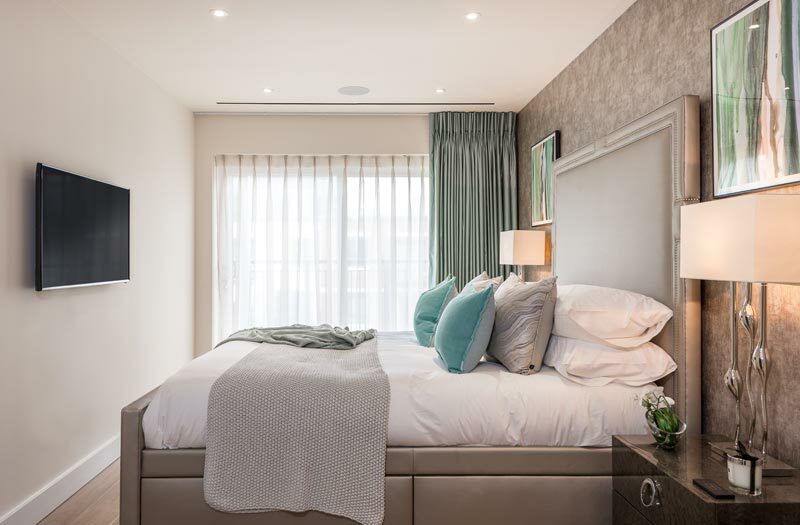 Perfect symmetry and calming colours create this relaxing, contemporary retreat in the second bedroom. 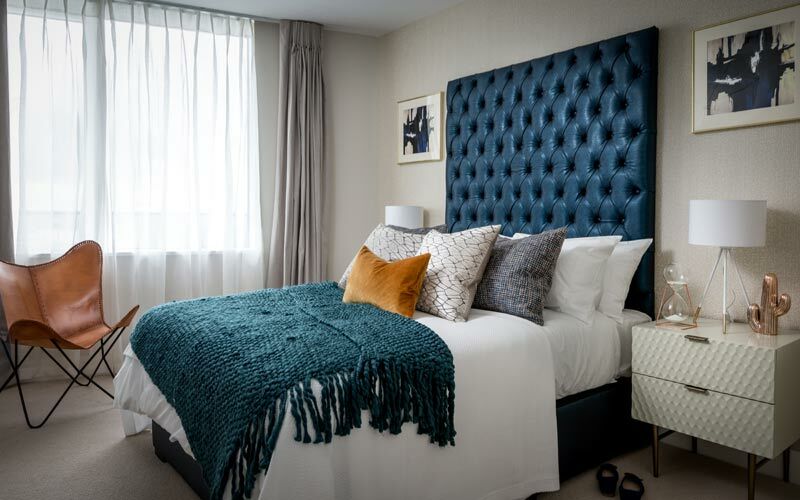 The team’s use of beautifully balanced design lends a refined feel, with navy blue accents, patterned wallpaper and luxurious soft furnishings adding a sense of dimension, interest and texture. 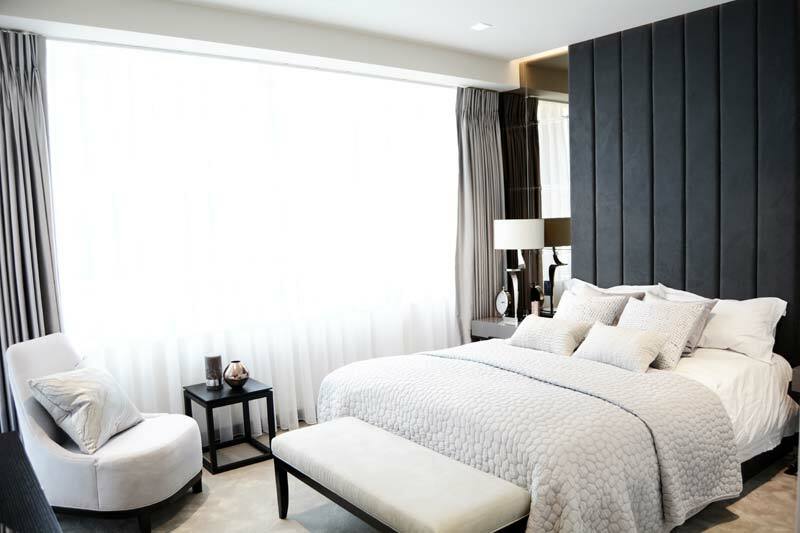 All of these elements combined creates an intimate atmosphere – a bedroom enveloped in sophisticated style and ultimate comfort. 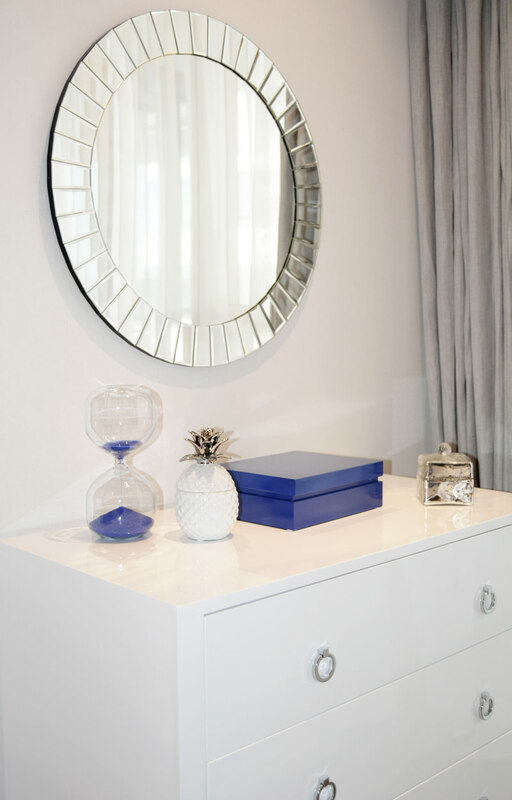 Tying the whole space together, a white cabinet, tabletop ornaments and bevelled mirror bring added flair and perfectly complement the bedroom’s striking, contemporary design. 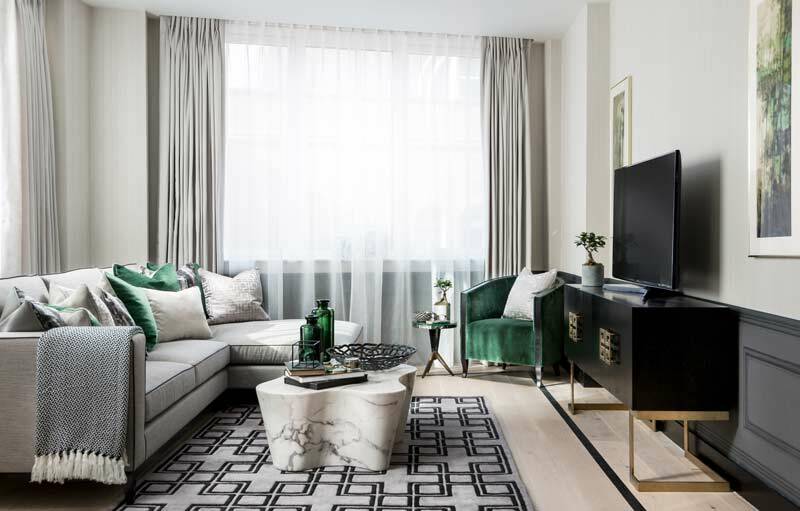 With a combination of fresh colours, high-end decor and timeless interiors, the client’s two-bedroom apartment was soon transformed into a wonderful living space – a home for relaxing, entertaining or a combination of the two. 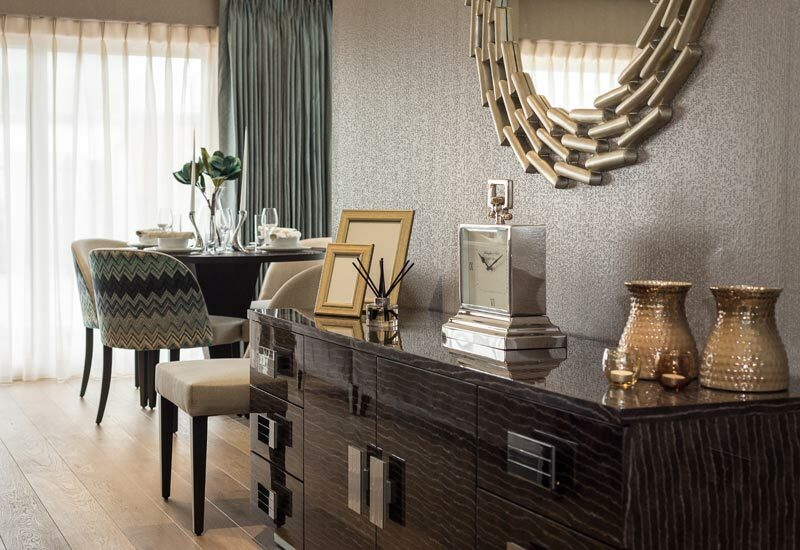 When it comes to beautifully crafted interiors, our design team has the special touch. Contact us today to get the look in your home.